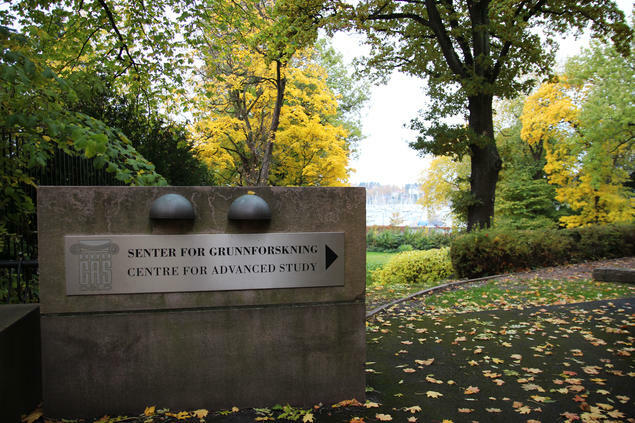 The leaves on the magnificent trees outside our building here in Oslo have turned yellow and red—the tell-tale sign that the academic year is underway. The Fellows of our three research groups have moved into their offices and common rooms, and the atmosphere is alive with conversation, deep thought, and analysis of their chosen topics. At CAS, we select one group from each of three broad divisions—humanities, social sciences, and natural sciences. And although these scholars might not appear to have very much in common in terms of interest and inquiry, I want to try here to weave together some threads that unite this year’s research groups. I will start by making a bid for the significance of interdisciplinary research and multidisciplinary environments, which lie at the very core of CAS. Make no mistake: although Berlin’s famous essay is framed as a wildlife parable, it is, in fact, about ways of knowing. As a young Oxford scholar who was already a promising social and political theorist, philosopher, and historian of ideas, Isaiah Berlin first intended this humorous animal analogy as an entertaining intellectual game to be played within college walls where the dons could be categorised as ‘hedgehogs’ or ‘foxes’. However, the wisdom captured in the ancient fragment soon took on a life of its own. The division of humanity into ‘hedgehogs’ and ‘foxes’ became not only a witty means of classifying styles of knowledge, but also an existential way of confronting reality. Foxes, their minds buzzing with ideas, soon realize that a single consistent worldview is beyond their grasp, and thus they must reconcile themselves to the limits of what they know. The hedgehog, by contrast, relentlessly pushes for deeper and purer knowledge, permanently dissatisfied with the world in all its complexity. The purpose of the hedgehog is to know one big thing—and to desire the moulding of existence into a unifying shape. 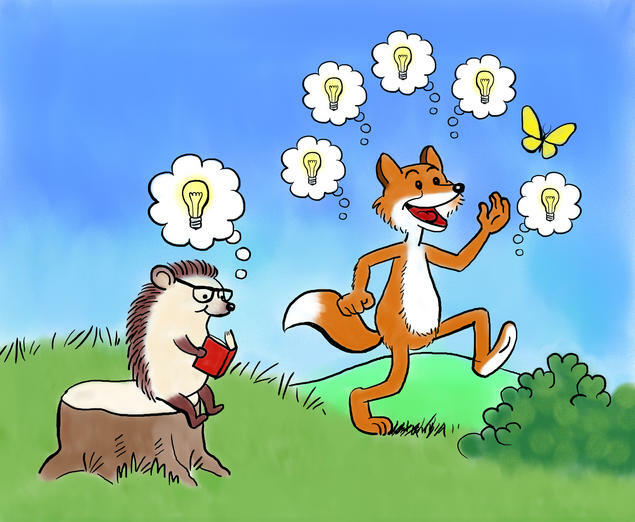 The distinction between the pluralistic fox and the single-minded hedgehog has become emblematic of the division among academic disciplines, and between generalised and specialised knowledge. The generalist or the specialist? We live in an era of hyper-focus and expertise. We wake up every day to the voices of ‘experts’ of all sorts, clamouring for our attention on the radio, TV, newspapers, Facebook and Twitter—and many of these opinions are voiced by scholars. Each academic discipline, and sub-discipline, carves out a scholarly province and pursues it relentlessly, accumulating vast amounts of highly specific knowledge couched in a vocabulary comprehensible only to the initiated. In effect, we, as researchers, are dwellers on disciplinary islands of the similarly educated and the like-minded. 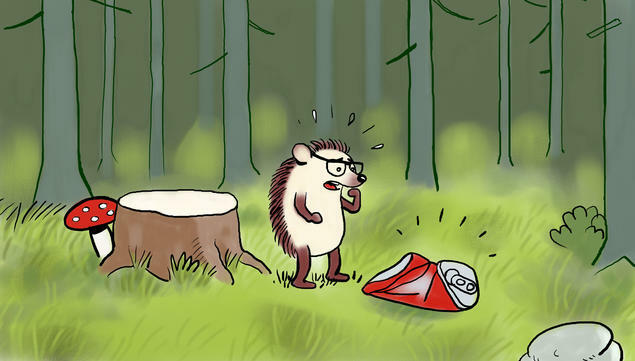 The single-minded hedgehog rules the academic world. In other words, we live in a world of intellectual fragmentation, in which exchanges between and among fields have become increasingly difficult. In his seminal book The Structure of Scientific Revolutions, published in 1962, the historian Thomas Kuhn identified what he termed ‘disciplinary matrixes.’ Here, groups of scholars share a set of methods, standards, and basic assumptions—a paradigm of values. Translated into the terms of my own discipline—anthropology—we could say that the members of these groups all share a common culture: they are united by a cosmology, they speak the same language, they practice the same rituals, while disagreeing only on some of the finer points—just as is the case in any of the tribes typically located in peripheral places of the planet. However, anthropology has met many cultures and specific customs and knows that it is not only possible to translate between them, but also that cross-cultural communication is necessary if we are to comprehend and respect the diverse experiences of being human on this earth. And to accomplish this we need to bring back the pluralistic fox. If we step back in time to the European Enlightenment, when the building of a scientific foundation for all knowledge was on the agenda, famous scholars, intellectuals, and authors were all well versed in the great ideas of the time—whether those ideas were articulated in philosophy, literature, aesthetics, political economy, or biology. To be cultured was to be educated across the whole spectrum, and both gentlemen and gentlewomen were expected to master the art of writing in an eloquent style that could be appreciated by any cultured person. What united the educated European elite was the so-called Western Canon of Greek and Latin, and this ideal of an interdisciplinary and generalist schooling lasted until the Second World War. The post-war expansion of education beyond elites, the growth of empirical research, technological innovation, and the explosion of digital access to information, killed the idea that any human being could master a core body of knowledge that crossed all disciplines. Today, it would appear that the academic world of the generalised fox is gone forever, and there is no doubt that the new disciplines carved out by the hedgehog have resulted in huge advances in science and knowledge, translated into useful applications for the betterment of life and living. However, there is also a cost associated with this fragmentation of academia. Robert Hutchins, a former president of the University of Chicago, once memorably said that his university was a ‘collection of separate schools and departments held together only by a central heating system’. On the other side of the coin, however, much good has come from specialisation: indeed, interdisciplinary vigour and breadth are dependent on a prior narrowing of perceptions. So we clearly need both foxes and hedgehogs in our pursuit of new understandings and for new ways of combining disciplinary knowledge and the re-configuration of disciplinary boundaries. Here at CAS we seek to nourish both foxes and hedgehogs, and to stimulate both pioneering research and the productive potential of interdisciplinary engagements, because we know that novel ideas are often born at the interface between scholarly traditions and new thinking. Conversations among people working in different areas can only benefit everyone involved, but the hurdle we need to overcome is that the intellectual spaces belonging to one discipline do not necessarily belong to another. Most of the research groups we host at CAS do not represent one discipline only. Many are composed of different disciplines within, and sometimes across, the broad landscape of the natural sciences, humanities, and social sciences. Personally, it has been fascinating to me to observe how interdisciplinary encounters typically start out with a sort of scrambling of terms and beliefs. This results in a kind of initial chaos and not a few misunderstandings that are, however, gradually cleared up, so that by the end of their stay most of our Fellows agree that from those efforts to build bridges have come interesting questions, if not final answers, around which we can organise future research and theorising. And this is in fact what research is all about—a continuous process, and not a fixed end point: a collective endeavour for which we need both foxes and hedgehogs and, preferably, to have these contrasting modes of knowing brought together in the same arena. This brings me to the introduction of the three research groups for the coming year. They will all work with novel and exciting ideas that may push at the frontiers of research in their respective academic fields, both within and across the groups. 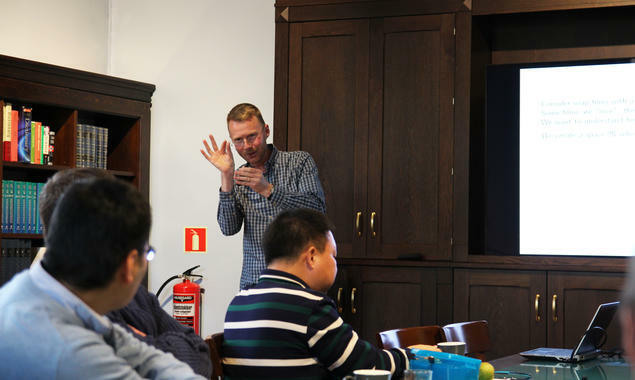 We have a group of mathematicians focusing on Several Complex Variables and Complex Dynamics, led by Professor Erlend Fornæss Wold, University of Oslo, and Professor Berit Stensønes, Norwegian University of Science and Technology (Trondheim). At the heart of this project is the puzzle of imaginary numbers and the cross-fertilization of algebra and geometry. The next group is interdisciplinary, consisting of anthropologists, media scholars, historians, chemists, and chemical engineers; it is led by Professor Mette Halskov Hansen, University of Oslo. 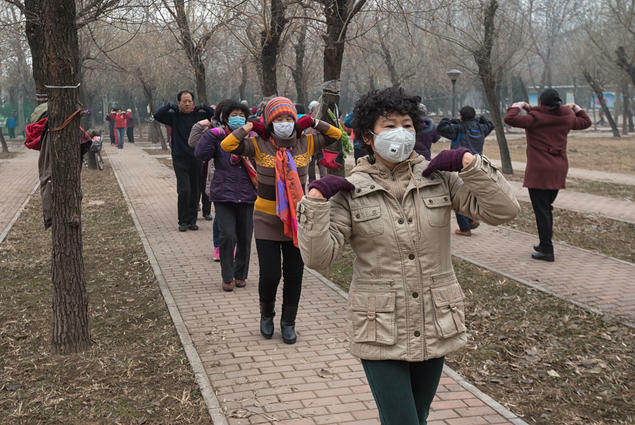 The project is entitled Airborne: Pollution, Climate Change, and New Visions of Sustainability in China. The third group, led by Professor Bjørnar Julius Olsen from the University of Tromsø, is entitled After Discourse: Things, Archaeology, and Heritage in the Twenty-first Century. This is also a multi-disciplinary group working at an intersection of archaeology, anthropology, geography, and history. Judging from the project titles alone one would assume that these three groups do not have much in common. They were of course chosen on their own academic merits, and not because of the way their topics could form bridges to the other research groups. Thus, I feel it is important to briefly sketch out some of the general scholarly framework that seems to unite these groups. For there are some interesting and intriguing connections between them that can broadly be classified as a turn to a new realism—a turn that is particularly significant and novel in the case of the social sciences and humanities: the natural sciences have always been wedded to pursuit of the forces underpinning the real world beyond what humans may initially perceive. As an anthropologist and Africanist long interested in the semiotic and sensual poetics that is not only a play with words, but also, powerfully, with the materiality of the real world, I welcome this turn. It is congruent with a broader, more recent ‘turn to matter’ across many disciplines in the humanities and social sciences, as a reaction against decades of linguistic dominance in which almost everything—even the human body—had been viewed exclusively as a question of signification and representation. As physicist Karen Barad so succinctly puts it in her critique of idealism, ‘Language matters. Discourse matters. Culture matters. There is an important sense in which the only thing that does not seem to matter anymore is matter’. Barad’s concerns are being addressed and we have entered a period in which the balance between idealist and materialist elements in Western cultures and beyond has tilted towards a new materialism. ‘For at least two decades’, the literary scholar Steven Connor wrote in 2010, ‘there has been a slow, incremental, but by now immense stirring of things’. This ‘thingly turn’ is not only a recognition of the shaping influence of objects of all kinds in human life throughout history and across societies. Material culture has of course always been the staple of archaeology and anthropology. What is new is the attention paid to what anthropologist Mary Douglas, in 1966, called ‘matter out of place’. This matter disturbs our boundaries and classifications, and may seem disgusting, marginal, and threatening—air pollution, ruins, broken things, castaways, and landfill. And yet, what matter is deemed filthy in one culture and context, may be praised when viewed from a different cultural perspective. Whatever the case, both the Airborne and the After Discourse projects are confronting and exploring the things that constitute this ‘matter out of place’. Why this renewed interest in what we might call the marginal and the abject? We live in uncertain times, where the parameters of the natural world that contain us are being shaken by eco-catastrophes threatening climate, the oceans, and biodiversity. Looking to the future, our physical lives seem suddenly more precarious, and matter seems to be out of control. In other words, the former docility of objects and matter, the relative ease by which they could be moulded by technology to suit human needs, or simply appear as the disposable wrappings of our ideas, has come to an end and things have taken on a seemingly unruly agency of their own. Here at CAS, we aim to be at the cutting edge of research developments. If the world is being shaken and the forces operating on us today require us to rethink the weight that materiality exerts upon culture and consciousness, it is also crucial that our re-valuation of this material history does not overcompensate in the other direction, and does not make light of those immaterial aspects of reality that only mathematics and physics can reveal to us. From the nineteenth-century physics theories of electromagnetism and statistical thermodynamics, for instance, to twentieth century quantum mechanics, the exploration of imaginary and complex numbers continues to push our knowledge towards new horizons. Only the magic of numbers and new forms of mathematical equation can make invisible forces real for us. A blending of the material and the immaterial takes place across our three research groups to varying degrees. And this, I would argue, places them on the new frontier of what philosophers of the school of object-oriented ontology have recently termed ‘hyperobjects’. Hyperobjects are impossible to completely grasp, being multidimensional and massively distributed across time and space. 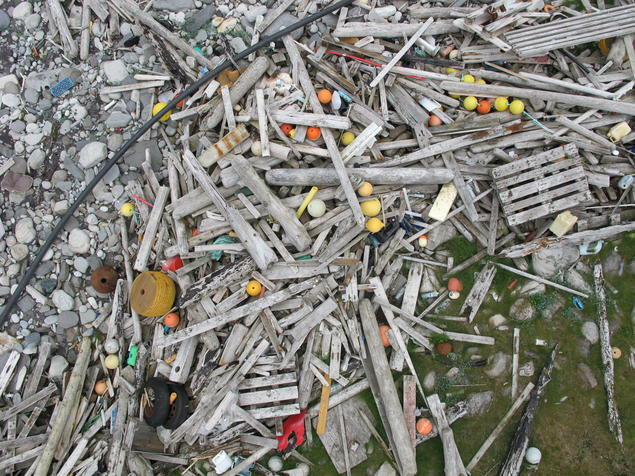 According to Timothy Morton, hyperobjects tend to ‘stick’ to other entities, but the local manifestation of, say, a piece of plastic swept up on a beach, and its subsequent merging with solidified oil, is not directly the hyperobject. The merging of plastic and oil has made a new aesthetic object in the interrelationship between the two. Hyperobjects live their own life, irrespective of human knowledge about them; they are non-local and involve temporalities that extend far beyond the human scale. Plastic, for instance, has a lifespan of 500 years; planets in their orbits have an almost endless temporality, generating space-time twisters. Everyone is deeply affected by hyperobjects, even if they strive to deny their existence. 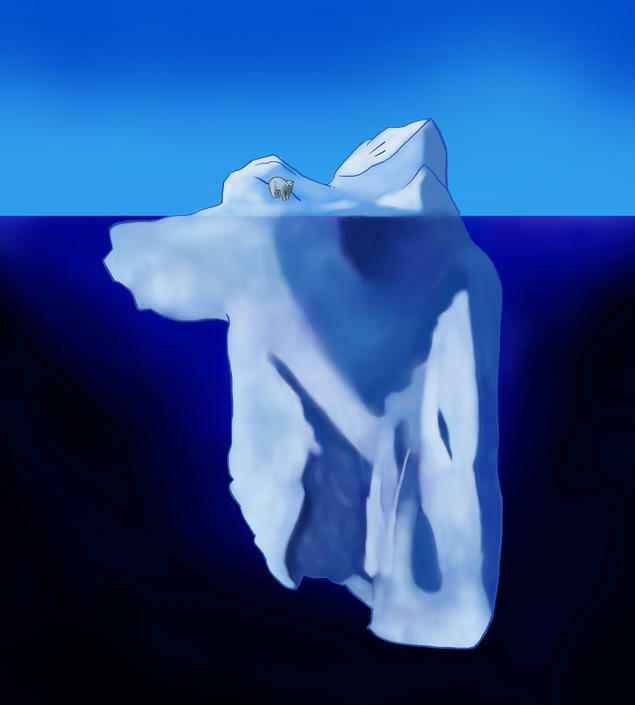 Climate, natural oil reserves, air pollution, markets’ marine debris, soap films, Styrofoam, are all such hyperobjects, and all are impossible to comprehend in the way that ‘simple’ objects may be grasped. This is just one of the exciting new frontiers we are working on here at CAS this year … so please follow us on the web, Twitter, Facebook and my blogs, where we will keep you updated on the exciting and ground-breaking research that is taking place at CAS.